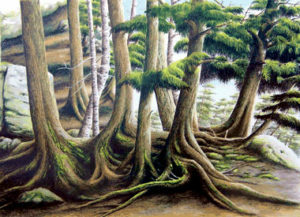 At Art One Alan Rutherford teaches several art classes such as Acrylic, Watercolors, Pastel Drawing and Pencil Drawing. While on a camping trip to Silent Lake,I decided to take a hike one afternoon along the lakeshore. Always one for visual metaphors, I began to see a parallel between the stand of trees and the families of homo sapiens. Moss on those intertwined roots made walking up the grade rather difficult if you hadn’t paid attention to your footing, similar I surmised to family interaction. After naming this piece “Family Tree” I thought little more about it. Never did I imagine the effect this title would have in the near future. My wife and I had been attempting to start a family for more than seven years, and had basically accepted the fact that it would be just the two of us. Two weeks after giving the piece it’s title, we received the joyous news that my wife was pregnant. I guess you could call it life imitating art! We now have a marvelous daughter Alyson Skye Rutherford.The lesson to be taken from this work for me was never to give up hope. “Lloyd was a great instructor that inspired me to express myself in my art. He taught me that all art is beautiful and a little creativity goes a long way when you’re trying to achieve your goals. Art One Academy wishes Fatemeh all the best in her creative future.